This wonderful portrait of an unknown sitter is by Edward Steichen and dates from around 1915. It is part of a small hoard handed to New York gallerist Howard Greenberg by Joanna Steichen, the photographer’s widow, in 2008, which has now appeared in print. Eduard et Voulangis (he changed the spelling of his name), published by Michael Torosian’s Lumiere Press in collaboration with Howard Greenberg, reprints a number of pictures from the period 1915 – 1923 when Steichen lived in France, including a couple previously unkown. 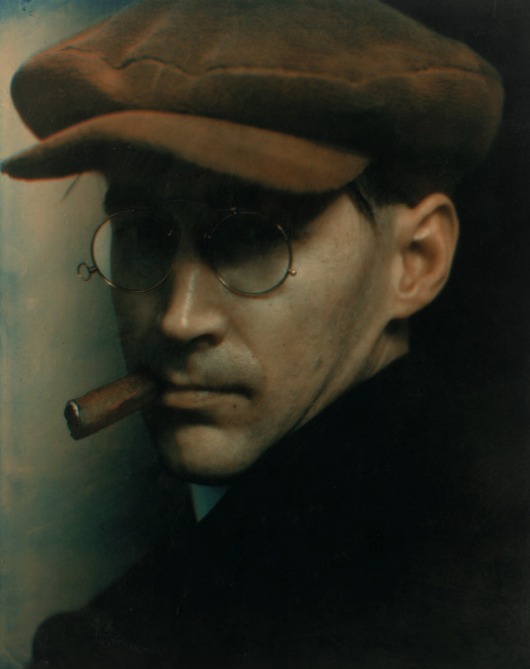 As Torosian writes in an essay in the book, Steichen at the start of the 20th century had described himself as “a painter, first, last and all the time,” regarding his painting and photography as “symbiotic.” After witnessing the First World War, though, and after meeting artists such as Picasso and Matisse, he changed his tune, deciding that photography was the medium of the age. One day, in a gesture we might well find symbolic, he made in his garden in Voulangis a bonfire of his paintings. Then he photographed a white cup and saucer. Steichen became the head of the department of photographs at the Museum of Modern Art in New York, and so one of the powerful arbiters of what photography could be or should be. It is arguable (and this publication makes the case) that his Voulangis period signals the end of Pictorialism as a major force and the moment when Modernism took over. I have argued that photography continued to retain a strong Pictorial undercurrent, and still does. I suspect that current will rise back more towards the surface as the Modernism plays itself out. No need to take sides, though, to appreciate the portrait. The whole point of the Lumiere Press venture is exquisite reproduction. Howard Greenberg describes the group of pictures in these terms: “an astonishing bouquet of experiments in toning and multiple-printing processes. The colors seemed to me otherworldly.” It is with some misgivings, therefore, that I reproduce it here. But for those who will likely never see this rare and expensive new book, it is a pleasure to be able to do so, even if what appears here is only a shadow of the reproduction, itself an approach to the print that Mrs. Steichen handed to Howard Greenberg. By the way: Steichen is not known for his anonymous portraits or type portraits, but rather for pictures of known and even eminent personalities. If anyone should happen to know with certainty who the sitter is, please give the name in the comments here or otherwise make it known. This entry was posted in Photography and tagged Edward Steichen, Henri Matisse, Howard Greenberg, Lumiere Press, Pablo Picasso, Pictorialism by Francis Hodgson. Bookmark the permalink. Vasari wrote the famous book about painting five centuries ago, essays about photography started recently. No surprise that some masterpieces of photography – made a century ago – appear only now, such as pictures made by Steichen. I have got the impression that, at the end of XIX century, Berlin was the crossroads where Steichen, Stieglitz, Prokudin-Gorsky met at the university, in the school of prof. Vogel. The Russian artist Prokudin-Gorsky (died exiled in Paris in 1944) made the first color portrait of the writer Lev Tolstoj (1908) published in the magazine ‘Foto Liubitel’. In this magazine are published works of Steichen, who is considered a master of pictorialism practiced in Russia by many photographers. The route Berlin-St. Petersburg-New York should be studied in the same frame. could very well be Berthold Brecht ! He was good looking when he was young!! It is very tempting to say “Bertold Brecht”… but this photo was taken or printed c1915, meaning that Brecht was about 17 years old! So I don’t think it is Bertold Brecht. It is very tempting to say “Bertold Brecht”! But this photo was taken c1915, meaning that Brecht was about 17 years old at that time. So, I’ll say it is not Brecht.